What sources of data can be used for planning and evaluating KT projects? 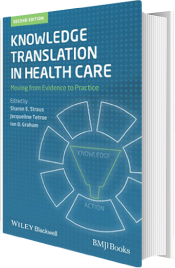 Electronic medical records (EMR), personal health records and other large clinical systems have data that can be analyzed to show evidence–practice gaps and evaluate KT interventions. Mobile health is also quickly becoming an important KT tool for both delivering care and data collection before, during, and after KT implementations. What informatics interventions might be effective in achieving KT? One of the areas in which informatics may have the greatest effect on KT interventions is the use of the Internet to educate and support clinicians, patients, and families in relation to health and wellness. The most effective use of the Internet for educating and changing behaviour is if the intervention is ongoing and has multiple components, such as goal setting, individualized support or tutoring, and communication with real or “electronic” personnel. Computers are excellent at storing, synthesizing, and presenting data in an efficient and user-friendly format. CDSSs are electronic systems that aid clinical decision making by generating patient-specific assessments and recommendations through software algorithms that match individual patient data to a computerized knowledge database. Such systems can “push” information to clinicians through alerts or reminders at the point-of-care, or through system-wide approaches, such as evidence-based order sets. CDSSs are superior to paper-based resources because they are more flexible and can rapidly retrieve vast amounts of data, perform time-consuming calculations, and navigate complex care algorithms. They can also present information “just-in-time,” without overloading providers with unnecessary data. Finally, CDSSs can improve care by giving clinicians performance feedback on quality indicators, enabling them to identify and bridge their own practice gap. CDSSs have been shown to improve care when they are used directly by patients. Patients can enter data into a CDSS, which processes, transfers, and presents the data directly to their physicians. Such systems can facilitate clinician decision making, and influence clinician decisions through patient prompting. Alternatively, CDSSs may empower patients to self-manage chronic diseases, or to guide complex medical decision making.